The last two weeks have been pretty manic as I've had a work trip to Canada and the UK, and I tried to sort out some bits back home in England at the same time. Toronto is pretty cold at this time of year, with temperatures between minus 12 and minus 7. When I arrived it was brisk but clear, with no sign of snow - something which didn't last very long with snow coming in quickly on the second day of the 5 day visit. I left before it got too deep in snow, and headed back to 'the other side of the pond'. The tenants have moved out of the house in Buckinghamshire, so it was time to do an inspection and to do some much needed maintenance - with the assistance of IDD, D and their new grafter, S. As it was also Mothering Sunday, I had planned a quick trip to Cambridge to see the family. First sight of the house in Bucks seemed pretty good until I noticed a place where the paint was flaking away from the wall in a very characteristic way - water damage! I'm getting far too familiar with water damage here in NL, and a quick exploration quickly showed that the grouting in the ensuite shower had given up the ghost after many years of use and water was leaking through the walls. IDD & D were not in the slightest bit phased by this however - so out came the tools and off came the tiles to find out how bad the damage was. 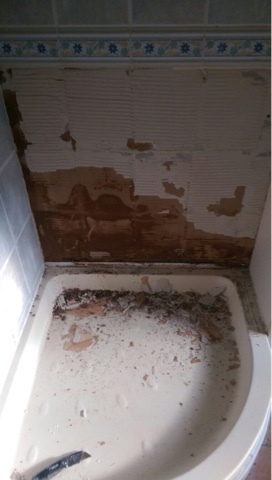 The water had waterlogged the wall, but hadn't caused major damage - it wasn't necessary to completely redo all the plaster. 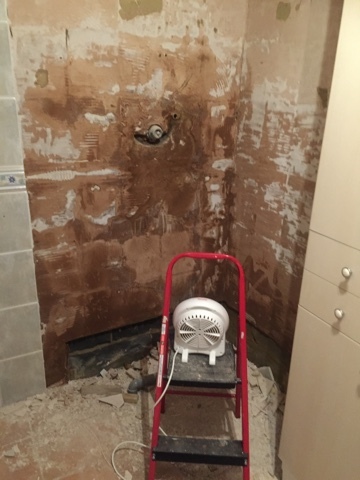 Two days with a hot air blower focused on it lifted the majority of the moisture out and had it ready for re-tiling and refitting of a new shower. Whilst everything was drying out, I took a quick trip to see the family - and quickly got embroiled in even more repair work. M has had many electricians around to quote to replace her overhead downlights with new LED fittings - and each time, as soon as they have quoted they disappear off the face of the earth. IDD kindly nipped up into the attic to have a look - and reappeared looking quite ashen. 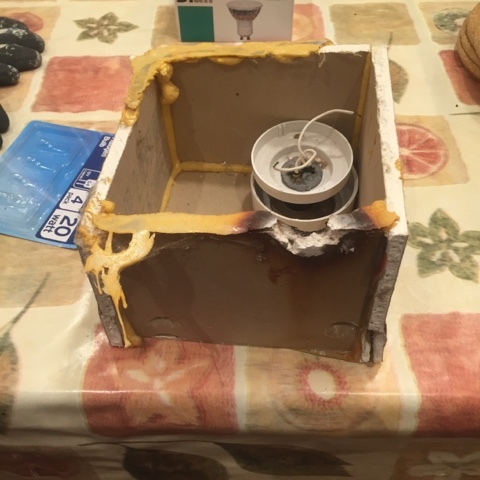 After I'd followed him back up, it was quite clear why - the downlighters were a very old model, with bare wires and in many cases had scorched the plasterboard boxes around them - a MAJOR fire hazard. Immediate down tools in Bucks, and all hands to the pumps to sort out the Cambridge electrics the next day. The loft is remarkably small and it's a good thing that D is a lithe and slim young man, able to shimmy around in some of the smallest of places. My task was to run around the countryside finding matching light fittings - apparently very few DIY stores stock enough downlighters to do more than a half dozen lights in one go. Thankfully we did manage to get everything done in one day and M now has a much safer home! Back to Bucks and on with painting, tiling and shower fitting and a million little tasks like changing batteries, lightbulbs and tightening bolts. 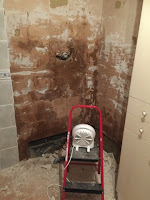 Thankfully IDD, D & S took it all in their stride and ploughed solidly through all the tasks whilst I juggled work email, calls and trips to DIY stores. 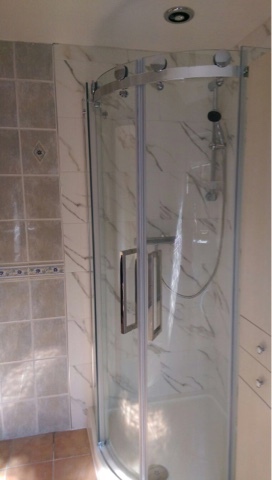 I love the new shower, and the new extractor above it will help to make sure that there is no moisture build up in the small room. Sadly we couldn't match the original tiling, and didn't have time to strip all and start again, but the new tiles are lighter and illuminate the dark corner of the ensuite. A week later and I'm home, tired and slightly grouchy after a week of sleeping on a very dodgy air mattress!